Why Heat pumps really save your heating bill. 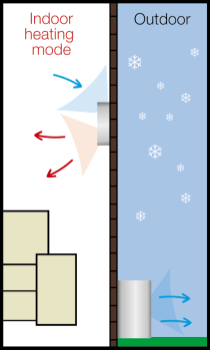 The amazing benefit of heat pumps is that they have no heating element (see ‘How heat pumps work’ – below). All other forms of heating – gas, electricity, oil, and open fires – burn energy to create heat, with various degrees of efficiency. The only electricity that heat pumps consume is the limited amount needed to drive the heat transfer process, which redistributes the warm air. To gain maximum savings – check the Energy Rating of the brand you are considering – the higher the rating, the more efficient the model is. Savings can be as high as 75% over traditional heaters. Heat pumps simply transfer free heat (not air) from one place to another, just like your refrigerator does. The heat that rises from the back of your fridge is coming from inside. An evaporator coil extracts warmth from the air inside, and transfers it out into your kitchen through the condenser coil in the back. Heat pumps work in the same way. Two coils, one inside your home, and one outside are linked to draw warmth from the outside air (even on a cold Kiwi winter’s night) and transfer it into your home. That’s a major advantage over electric or gas heaters, as heat pumps have no heating elements to burn energy. Then, at the click of a switch your heat pump can run in reverse, acting as an air conditioner to pump heat out of your home reducing humidity and keeping it fresh and cool in summer. Switch onto cool, and the heat pump becomes an air-conditioner pumping heat and humidity out of your home, leaving it cool and very comfortable. How many rooms do you want heated? You can buy a single heat pump to heat a single area or room, a `multi-system’ to heat 2, 3 or 4 areas, or a fully ducted system if you wish to heat your whole home. Many people start with a single unit, and later, when they see just how convenient and comfortable heat pumps can be, go on to buy more units for other rooms. It is important to choose a brand you can trust. Fujitsu, for example, offer 6-Years full parts and labour warranty when you choose a Fujitsu Accredited Installer, or 5-years if you choose a non-accredited installer. Most other brands offer a 5-year warranty, and some cheaper brands offer 2 or 3-year warranties. Efficiency means lower running cost, and a healthier environment. By their very nature, heat pumps are the most efficient form of heating with electricity there is. But different brands also have different levels of efficiency too – check to see the ratings from EECA for the brand you are considering. 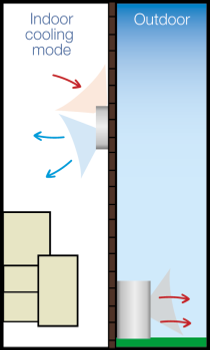 Most heat pumps are quiet indoors, as the only sound comes from the fan. The decibel levels of most heat pumps are shown in the brochure specifications. When choosing a heat pump and indoor units, consider the size of each room you plan to include in your new heating and cooling system. Size is important because indoor units have different capacities, measured in Watts. More Watts means more power and the ability to heat a larger room. Adjust your assessment depending on if each room is insulated, as the presence of insulation reduces the amount of heating and cooling power you need. Other factors affecting the heat pump capacity required include window area (double glazed or not) and, of course, climate. However, by simply multiplying the width x length of the room to be heated, the following table will give you an approximate idea of the heat pump capacity you will need. Brien Electrical are Accredited Installer’s and are best qualified to help you choose the most efficient model size for your needs. Indoor design temp 20˚C and outdoor ambient 7˚C. Nearly all heat pumps are split systems. That means they have an outdoor unit which contains the Compressor, and an indoor unit which contains the fan that circulates the warm air (or cooled air in the summer) in your home. These units are designed to be discreet both in appearance and operation. The outdoor unit contains the compressor, which is the busy part. The indoor unit simply has a fan to circulate the warmed or cooled air as required. The indoor environment is then quieter, with the equipment arranged like this. Choose the indoor type and model that suits you best. The most popular models. These slim, indoor units are mounted unobtrusively on a wall. They all offer advanced technology, including remote control, reverse cycle, sleep and digital timer, and moisture removal, and some offer additional features. A most discreet option, with only the grill showing in the ceiling. They provide heating and cooling in a range of capacities. Latest fan technology distributes conditioned air through 3 or 4 sides, with adjustable directional louvers. The Fujitsu compact cassette is unobtrusive, yet efficient and very effective. They feature brilliant air flow to reach the whole room, built-in timers, remote control and (optional) wired wall controller with 7-day timer feature. These floor-standing models are very compact, with a range of capacities, offering quiet, but powerful operation. These consoles look like a conventional gas or night storage heater – but don’t behave like one! They are quiet and surprisingly efficient, offering you the full range of capacities. Just one outdoor unit can power up to four indoor units. The highly efficient, quiet way to heat or cool up to four different areas. The indoor unit selections are Hi-Wall, Console, Cassette, or Bulkhead models to choose from. Making it easier to heat or air condition most domestic applications in New Zealand. These luxury systems heat or cool your whole home. Check air filters after 3 months use then clean or replace as necessary (some units will identify when filters need cleaning or be self-cleaning). If they can be cleaned: – remove and vacuum clean using a brush attachment then replace, or – wash gently with a mild detergent and warm water, and dry before replacing. Check the indoor coils (if accessible) – dust gently to clean. Check and clean condensate pan, drain and trap. Clean the unit cover with a damp cloth and mild detergent as required. Recognise the operational sound of the heat pump – if the sound changes, have the system checked. Ensure that air vents are not blocked by furniture or objects. At 6 months, check operation of condensate pump if fitted. Do not vacuum indoor coil fins as they are easily damaged. Make sure the unit is off when cleaning. Keep the area around the outdoor unit clear of garden waste and dirt. Remove any growth around or into the unit. Check and clean the outdoor coils when they are dirty. Contact a service person at any sign of unusual sounds or operation. Have an annual servicing agreement. Power may be switched off in line with the manufacturer’s guidelines.